In a highly unexpected breakthrough for this work, world renowned neuroscientist Miguel Nicolelis and Co-author Blue brain project mathematician Ronald Cicurel have published a book which explains how their research replicates the central set of hypothesis in Dipole Neurology theory. 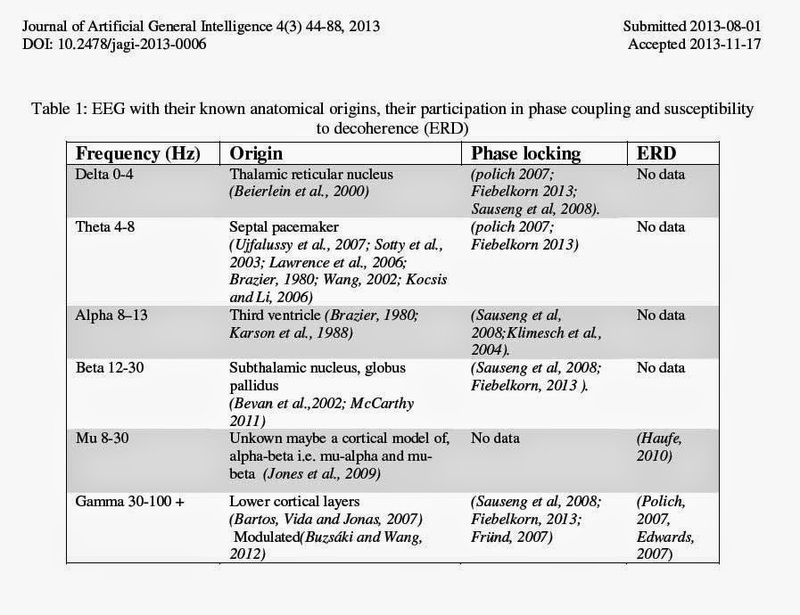 They then concur that we should conceive of the primary (cortico-limbic) structure in terms of a division into grey/white matter to derive a similar type of fundamental physics hybrid dual process “computation engine” (see Section 4 Lanzalaco & Pissanetzky 2013 in references). Like the action entropy “information engine” (which refers to grey/white matter) I worked on falsifying with Professor Pissanetky it computes just by providing it a means to follow the most fundamental laws of physics. Relativism and Action-entropy are different interpretations of the spacetime frameworks.. So from similar premises, the same set of logical conclusions result. However there are also differences between our works but overall these are two sides of the same argument. i.e. 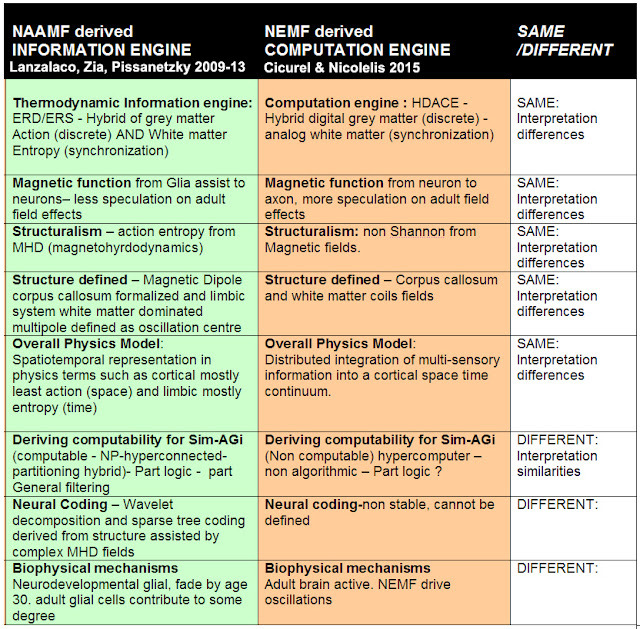 Differences about: The specific mechanisms then, conclusions on neural coding and computability. There is not space to go into all this here, but this is a table which summarizes all this. Relativistic vs Langranian thermodynamics, different sides of the same coin via the Hamiltonian ? 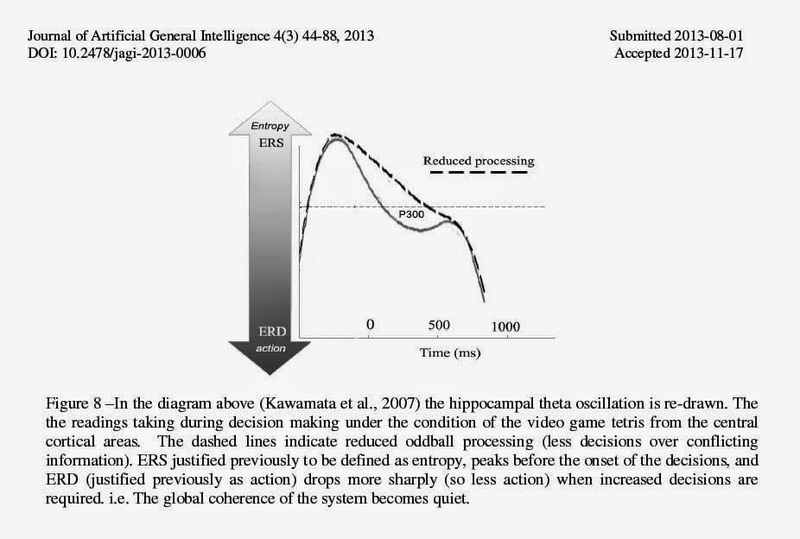 A point to note here is that relativistic view of spatiotemporal events or an action-entropy classical view are two sides of the same coin, for neuroscience purposes anyway. Relativity is derived from action as are EM and Magnetic fields and we can vice versa derive an action principle for Relativistic MHD (See Physics derivations in references). 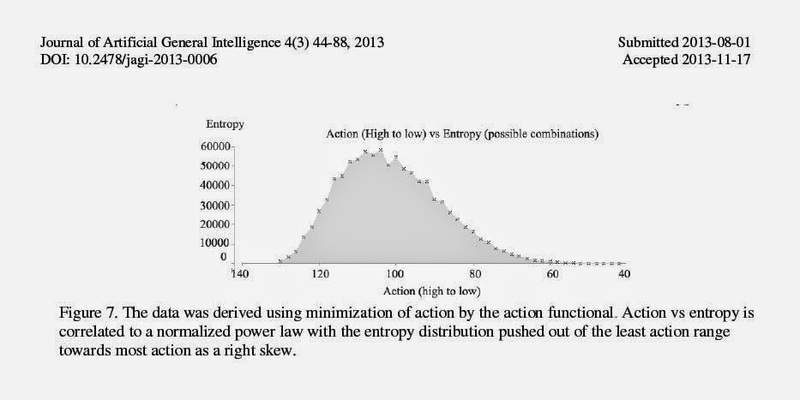 The reason I opted to put the formalization (Link to our 2013 JAGI paper) in terms of action-entropy was stated in the introduction of that paper. Basically Action-Entropy approach covers all bases. It allows us to make some distance from the original EM framework to determine if other aspects of it can be tested independently by the Causal logic approach used. 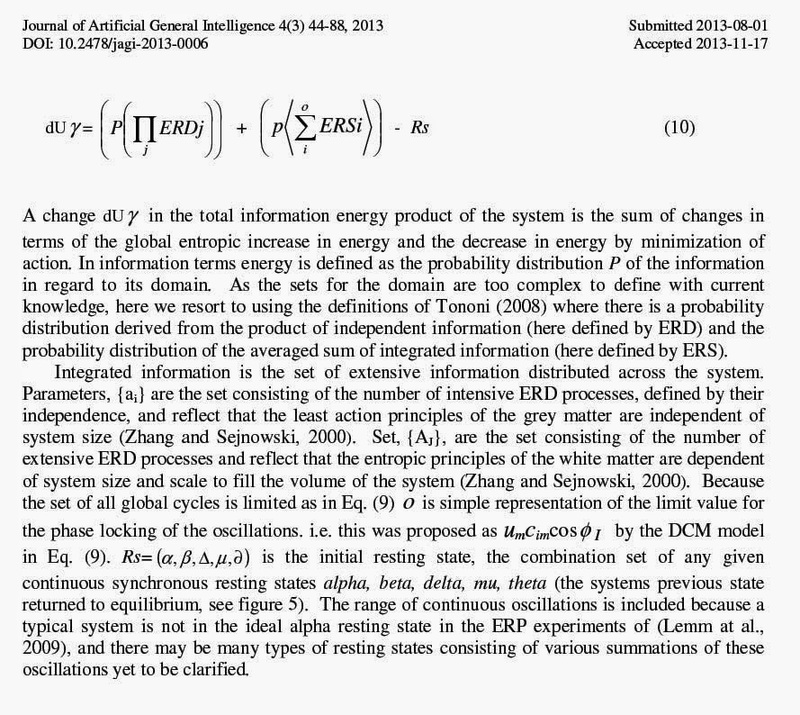 Second, that action is closer to thermodynamics and we can also derive EM from it, giving more options. And lastly that the least action principle was used by my Co-author Sergio Pissanetzky for his biophysics approach to AGi and general computation which we applied to formalize, unravel and test the dual process hybrid physics information engine. Spatiotemporal events are still present except action is defined in groupoids as casual sets of spatial vectors and entropy is the arrow of time. We can still define a quantum harmonic oscillator with action in groupoids, but relativity could be more useful to help decode synchronous firing. For example, in the brain time is integrated into oscillation bound information so there is a relativistic aspect there. Information bound to beta oscillations will be multiplexed in a different frame reference rate than information bound to theta oscillations. The brain does have mechanisms to resolve conflicts between and integrate these different frame rates, and there are some very specific models for how Dipole neurology predicts the representation of space and time across complicated brain structures, which are alluded to in the previous papers and this website. The entire approach including details for specific brain modules (as well as an educated guess for the brains neural coding schemes) is planned for the next publication. 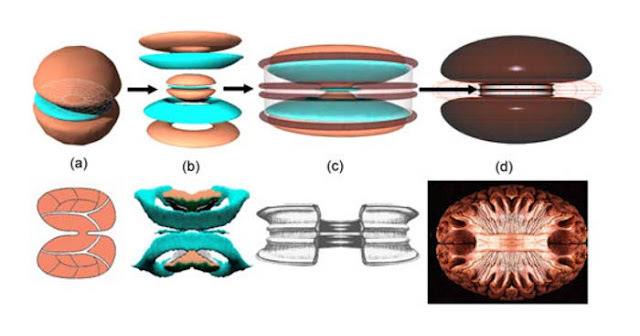 Magnetic brain models and structure, where we are now with EM fields ? 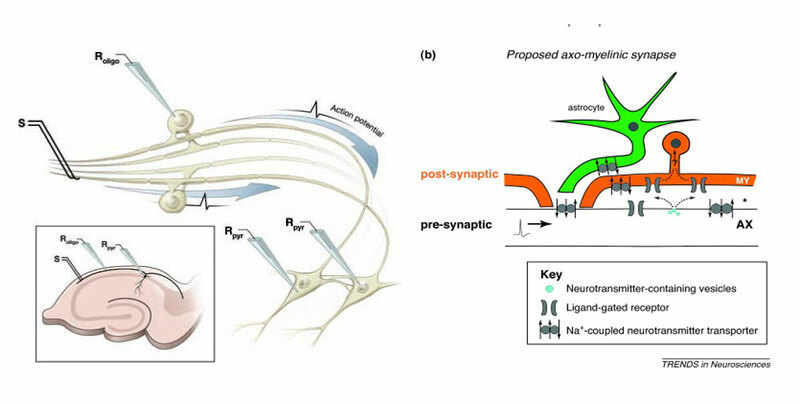 I have posted a summary of the latest research on axon solitons, white matter, glia and magnetic or ephatic fields here. Some of these are a big area right now, so a quick summary is required of what is being proposed here in biophysics terms. 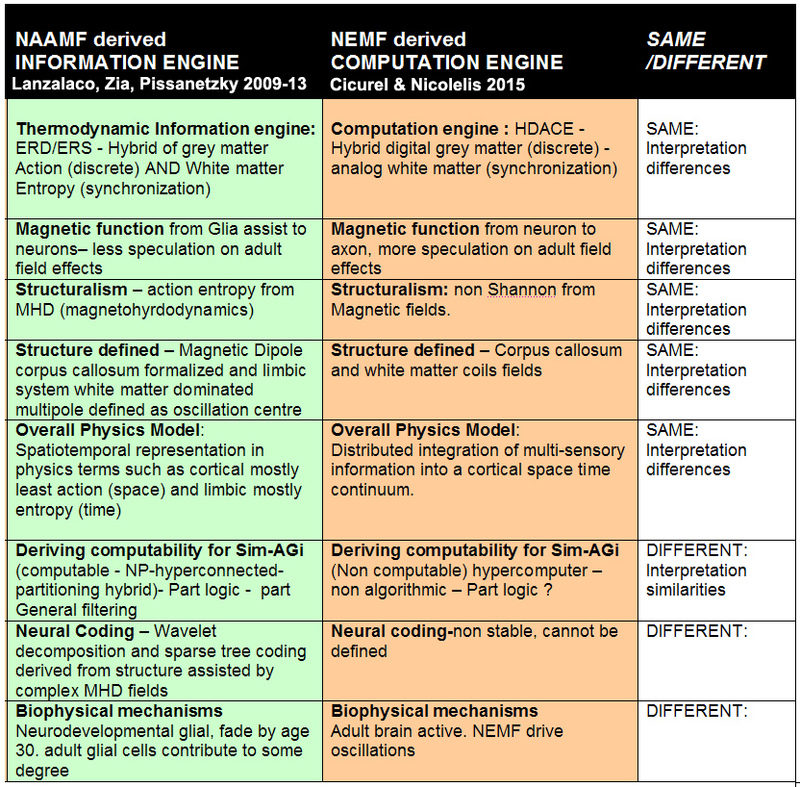 Initially I followed a magnetic model, but have for some time since 2009 primarily concentrated on a neurodevelopment theory for NAAMF. For that I have allowed myself to be guided by the experts in regards to how far on a limb to go with adult neuron function fields. The idea is to be careful not to go off into quantum mind territory, because the problem is always this. Current MEG readings do provide brain wide magnetic field, but these are derived from the sum of individual isolated neurons. There is no mechanism to amplify the magnetic field fall off in a tranverse plane across axons of any significant distance? Many are being developed , but even taking all the newest ideas into consideration the maximum number of axon solitons in a field would be a dozen or more and not brain wide. However, we know that we can cut of the neurons and the white matter oscillations still persist but this could be a network effect that was not controlled for (references in this post). Mostly we have learned in neuroscience biophysics is all very finely controlled by complex proteins interactions. 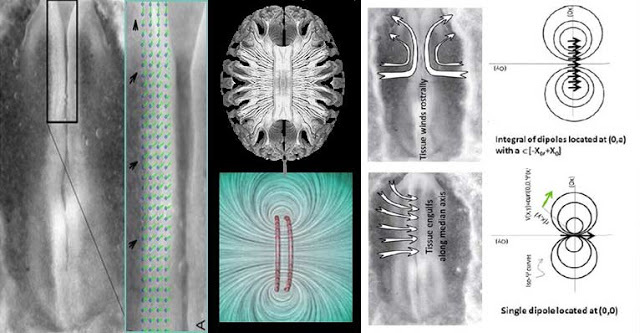 Does all this finesse rule out any crude generic magnetic field across white matter ? The complexity of ion channels and mechanisms even in the candidate for a magnetic mechanism, (the axon myelinic synapse) suggests these new concepts still obey regular neuroscience complexity. Douglas Field in his address pitched towards the Obama brain initiative does mention the white matter glia could assist slow wave timing coherence, but not by a field model. However as my last summary reminds me, there is a lot still to be found about the axons, and the reasons we have not is due to the lack of tools for that, and these are being developed now. My position is the fields are primarily large during developmental stages then fade to persist in glia but under restriction of myelin as we think. I keep an open mind on what could be going on in developed brains though as the brain has EM structure all the way through it. 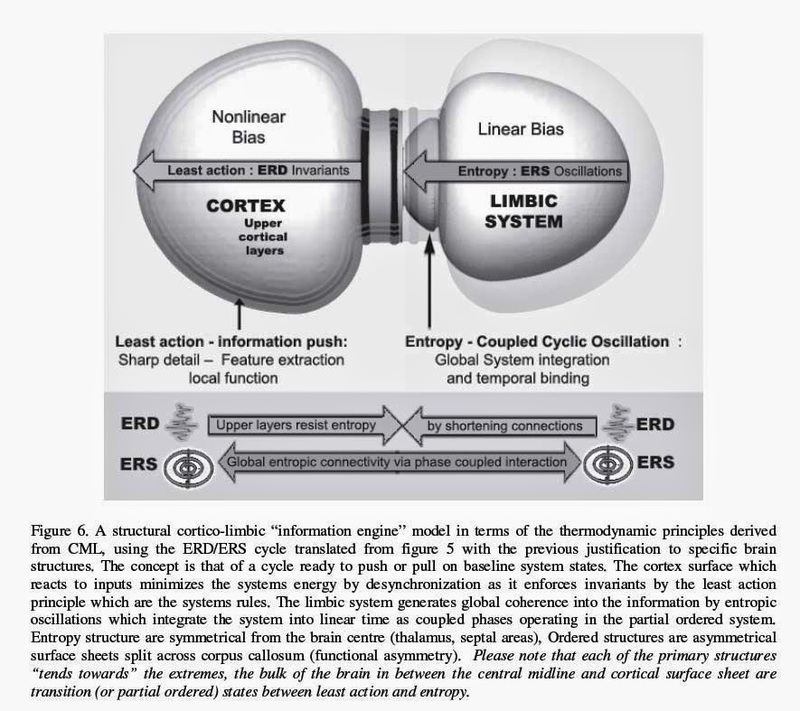 Linear multipole expansion is the proposed model for the limbic system morphology. See links in following text for more explanation. For now whats important to bear in mind is that MHD evolving the facility to layer such expansions allow distinct subcortical structures to evolve for adaptive functions, while still retaining whole information coherence through symmetrical continuous waves moving in and out of phase in a linear manner. i.e. Delta, Alpha, Theta, Mu, Beta interactions are fairly even lateral symmetrical phase locks (unlike sporadic asymmetrical cortical gamma). Its elegance is also its simplicity. MHD dipoles and Linear multipole expansions are easily produced by radial glia. In their most recent interview on singularity 1 on 1, the authors describe that the labwork, long sought after by myself and many colleagues involved with NAAMF (Lester ingber, Alfredo Pereria, Paul Nunez, Marcos Banachlocha) could gain the financial backing from Duke University to finally settle the biggest validation required for this nearly 15 year old controversial theory. 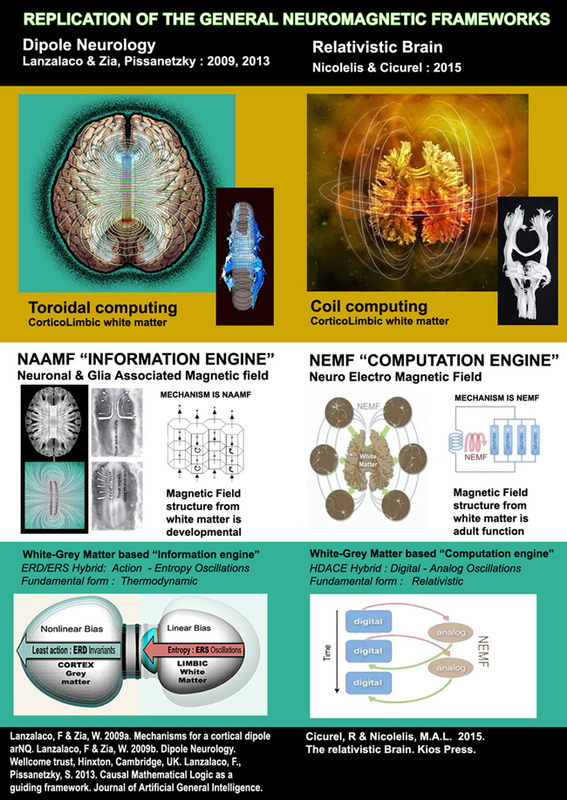 To track the actual MEG readings from white matter to brain wide neural synchronizations. This requires highly expensive equipment and expertise which Professor Nicolelis appears keen to ensure is provided. The publication of their book has prompted a project for many of the worlds leading magnetic brain researchers to form into a “Neuromagnetic research team” setup to further the major challenges of this frontier research, raise the media profile and push for funding. For that reason it is good time to summarize the proven track record of dipole neurology theory in terms of improving with new data. Lanzalaco, F., Pissanetzky, S. 2013. Causal Mathematical Logic as a guiding framework. 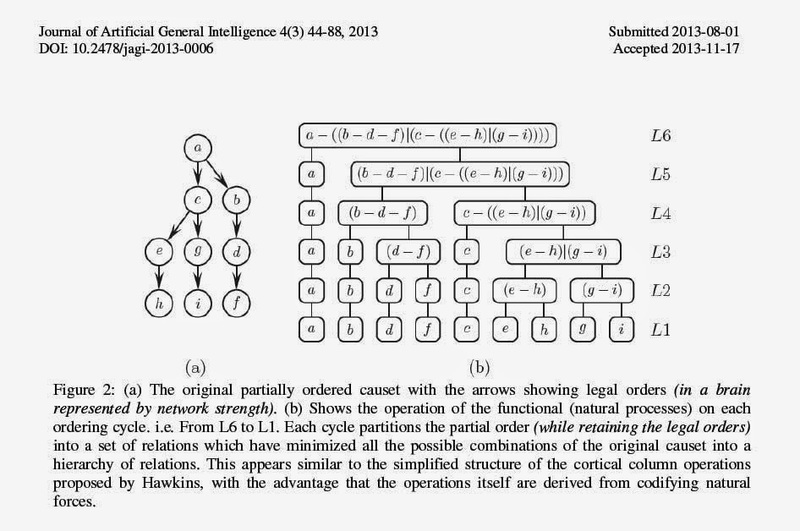 Journal of Artificial General Intelligence. Lanzalaco, F & Zia, W. 2009b. 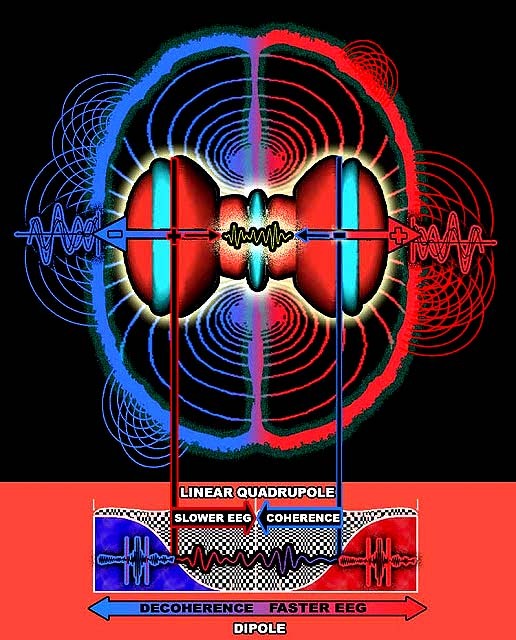 Dipole Neurology an electromagnetic multipole solution to brain structure, function and abnormality. Wellcome trust, Hinxton, Cambridge, UK. Cicurel, R & Nicolelis, M.A.L. 2015. The relativistic Brain. Kios Press.